Beginning on Monday, July 21, 2013 for approximately three weeks, Medford Street in Somerville will be closed to traffic between McGrath Highway and Ward Street to allow for top coat painting of the Medford St. Railroad Bridge. Pedestrians will still have access through Medford St. as one sidewalk will remain open during the duration of the closure. 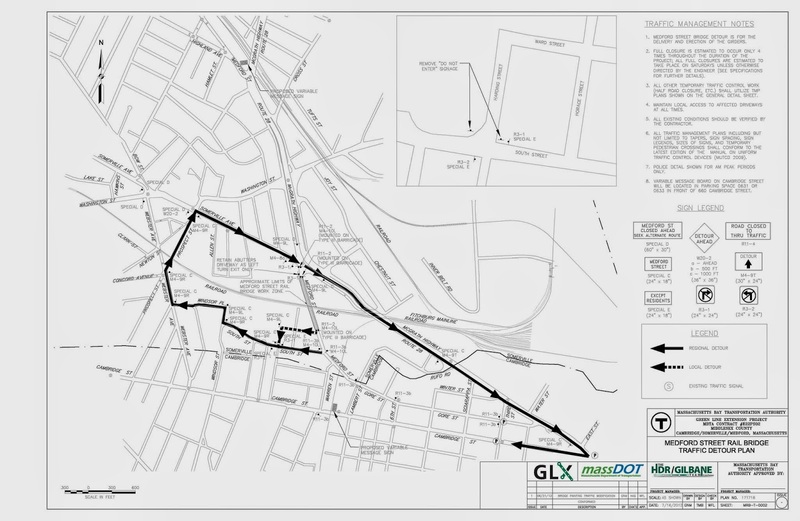 A map of the traffic diversion plan can be found on the GLX website here: http://greenlineextension.eot.state.ma.us/documents/MedfordSt_detour.pdf. This work is part of the widening of the Medford Street Railroad Bridge to allow for Green Line tracks to run alongside the Commuter Rail tracks. Thank you in advance for your patience. This work is an important step in bringing the Green Line to Somerville.